Starring in TV's top emergency drama is clearly a risky business. Only one actor survives from the original cast, and some of his best mates went out in boxes! 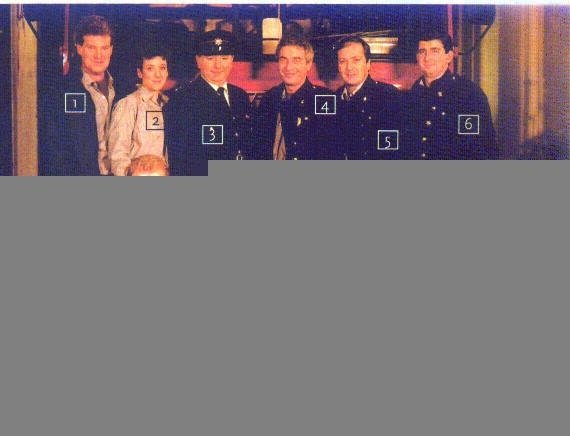 This week sees the return of London's Burning, which has been a ratings winner for ITV every since the series - based on a TV film by Jack Rosenthal - first came nee-nawing onto our screens in 1988. But the boys (and more recently, girls) of today's Blue Watch would barely recognise any of their Eighties forebearers. One by one the old guard have been written out, some simply quitting the Fire Service, others making the ultimate sacrifice to boost the show's ratings. Vaseline, played by heart-throb Mark Arden, was the first of them to die, drowned back in 1989 when he heroically tried to save a driver whose truck had fallen into Surrey Docks. Sub Officer John Hallam (Sean Blowers) was killed when he fell througha glass roof in 1996. But the worst was still to come. In the explosive final episode of the last series, one of the last two surviving members of the original cast, Sicknote, played by Richard Walsh, disappeared under a collapsing wall in a factory fire. Now only one remains. "Sicknote was my great mate" reminisces Glen Murphy, the sole survivor from the eighties. "And good luck to him. Richard is a proper RADA-trained actor; when he left he went straight into work on an Oscar Wilde play. I can just imagine him in a cravat!" 1. Connor Byrne as Rob "Hyper" Sharpe continues to live up to his spiky reputation, but at home provides a shoulder to cry on for his new flatmate Sally 2. Sam Callis plays Adam Benjamin, a veteran fireman brought in to replace Sicknote. Adam's a charming wheeler-dealer who encourages others to participate in his dodgy schemes. 3. Edward Peel plays John Coleman, the station commander. Viewers get an insight into his softer side following his romance with councillor Alison Hemmings 4. Glen Murphy plays George Green. Softened by his new love Andie, George has even learned to cook! But his career hangs in the balance after he is accused of theft. 5. Ben Onwukwe plays Stewart 'Recall' Mackensie, who's euphoria at falling in love with pub landlady Elaine is spoiled by the arrival of his son, would-be firefighter Ben. 6. Heather Peace plays Sally "Gracie" Fields, who's still dealing with the death of her lover Joe. Throwing herself into work, grieving Gracie remains one of life's fighters. 7. Fuman Dar joins Blue Watch as Ronnie "Hi-Ho" Silver. Teased straight away when the lads discover he's a virgin, he finds support after he confronts an horrific emergency. 8. Michael Garner plays new dad Geoffrey 'Poison' Pearce, a hate-figure who's lost none of his venom now he's been promoted to Watch Commander. 1988 - What's become of the Old Watch? 1. John Hallam Sub Officer was killed in 1996 falling through a roof. he was played by Sean Blowers, who is still acting but has now mainly moved to behind-the-camera safety as a producer of short films. 2. Josie Ingham, Blue Watch's first female firefighter, was played by Katherine Rogers until 1991. Today, along with regular TV roles, Katherine woks in theatre and is directing The Taming of the Shrew in Cardiff 3. Sidney Tate Station Officer, turned to drink, failed his medical and was taken off-duty in 1992. He was played by James Marcus who now combines a writing career with appearnces in series such as The Bill and Heartbeat. 4. Mike "Bayleaf" Wilson quit in 1994 to set up a restaurant. James Hazeldine spent much of last year with the National Theatre. he's Pandora's dad in the forthcoming BBC series "Adrian Mole - The Cappuccino years" 5. Bert "Sicknote" Quigley disappeared in an explosion in the last series. Actor Richard Walsh, who was back on TV in the Heartbeat Christmas Special is soon to tour in Oscar Wilde's Present Laughter 6. Leslie "Charisma" Appleby - so called because he didn't have any - quit in 1992. Gerard Horan was seen in The Sleeper at Christmas and has just filmed a new BBC series The Quiet Policeman.